I landed in Paris to read the sad news that Ted Sizer has passed away. This is the second loss of great leaders the progressive education community has experienced in just a few days. Earlier this week, Gerald Bracey died in his sleep. May they both rest in peace. If you don’t know whom I’m talking about or have not read their work, then ed school, we have a problem. It was easy to marginalize Jerry Bracey since his career was so deeply committed to using the tools of a hard-nosed researcher to expose their emperor’s lack of clothes. He was a university researcher – a wonk’s wonk willing to enter the arena and battle powerful forces and mythology without fear. Bracey fought standardized testing, the politicization of public education and demonstrated time and time again how the claims of public school failure are simply untrue. He was unafraid to expose the frauds who keynote our conferences and dominate professional development agendas. Some of us speak out on issues of concern, but we relied on Bracey’s research to fortify our arguments. I recommend that you read some of his recent Huffington Post columns here to get a sense of Dr. Bracey’s genius. I regret that I never had the privilege of meeting him. Ted Sizer was a different kind of radical. He was straight out of central casting – white, male, smart, articulate, soft-spoken, innovative, inspirational with a Patrician sensibility suited to running universities, government agencies or a think-tank. Sizer should have been the United States Secretary of education long ago, but American education policy is not a meritocracy. Instead, we have been saddled with a series of mediocre governors, talk show hosts, football coaches and Tasmanian minor league basketball players. Being right seems insufficient. Unqualified is the new qualified. Many of our large urban school districts are run by woefully inadequate people (NYC, D.C., Chicago, New Orleans come to mind). Unlike such bloviating union-busting marionettes, Sizer was a learned man who had actually led successful schools and developed a set of principles for others interested in doing the same. The Coalition of Essential Schools was built upon ten common sense and replicable principles. With all due respect, if you are a school leader who has not read Sizer’s three seminal books on high school reform, Horace’s School, Horace’s Compromise and Horace’s Hope, then I’m sorry, but you’re a pretender. It is worth reading Dr. Sizer’s views on effective (or as he calls it “admirable”) teacher education on the heels of Secretary of Education Arne Duncan’s mean-spirited misinformed attack on the enterprise. A collection of Dr. Sizer’s speeches for the Coalition of Essential Schools may be found here. The Coalition of Essential Schools’ Fall Forum (annual conference) is this November 5th-7th in New Orleans. You can still register. I wish I were optimistic that Sizer and Bracey’s work and spirit will live on and inform the future of public education, but even if ignorance is absent, amnesia will likely prevail. Chris Lehmann and I often remind our easily excitable friends in the edublogosphere that we stand on the shoulders of giants. Ignorance of history and the great thinkers that came before us not only dooms one to repeat the mistakes history, but retards the progress that would be possible if we recognized that as Bill Clinton said, “Every problem in education has been solved somewhere.” Alas, we continue to slip backwards. I get dismissed as an old crank if I suggest that colleagues read texts longer than 140 characters, attend conferences or think more deeply about fads. There isn’t a single discovery of an edublogger that Seymour Papert didn’t write in his 1996 book, The Connected Family: Bridging the Digital Generation Gap, but who wants to read books by experts when our PLN applauds our laziness? Just this week, one of my graduate students in a Masters in Learning Technologies course expressed surprise that I asked students to read Papert’s 1993 book, The Children’s Machine: Rethinking School in the Age of the Computer. How could what Papert wrote in 1996 or 1993 or 1968 possibly be relevant? Animoto and Plurk didn’t even exist back then! John Dewey must have lived in a cave. I am sorry, but Dan Pink, Tom Friedman and a boatload of Web 2.0 authors combined don’t know as much about teaching and learning as Ted Sizer or Gerald Bracey could share in an 800-word article or five-minute conversation. We must stop being so easily distracted by shiny web objects, rhymes and slogans. Seymour Papert and I used to talk at length about how the edtech community needs to know more about learning and how the progressive education community needs to understand how computers can amplify their ideas and offer learners unprecedented opportunities. Unfortunately, Dr. Papert was in a terrible accident and the summit we envisioned never came to pass. I do my small part by writing, speaking, recommending books and organizing events, but there is still much more work to be done. I created Constructing Modern Knowledge so that younger educators excited about learning with technology could situate those experiences within a context of powerful ideas – Deborah Meier, Lella Gandini, Bob Tinker and Alfie Kohn have been but a few such people who spent time inspiring CMK participants. I had really hoped to feature Ted Sizer in the future, but will redouble my effort to acquaint educators with powerful ideas and whenever possible with the originators of those ideas. We all need to get busy and get smarter. Our children depend on us. I’ve been waiting for months to be able to share this news with you. About 18 months ago I was asked to be in a film about creativity, math, science, engineering and imagination. So I shaved my mustache for the first time since I was eleven and headed down to the “shoot” at a Jetsons-influenced building adjacent to The California Science Center. The new documentary film, imagine it!² The Power of Imagination. is about connecting imagination and creativity with science and engineering in education. The 52-minute film inspires people to imagine a better world, unleash their creativity and take action to solve global challenges. One lesson I learned was not to shave for the first time in 34 years if the film is being shot in HD. The other is that I need a wicked cool British accent like Sir Ken Robinson. He gets an exponentially greater amount of face-time than this humble blogger. He can really rock that accent. Despite Sir Ken bogarting the film, some of my outtakes are on the Web for you to cherish for years to come. If you can’t get enough of Stager on screen, check out the video from when I rocked NECC this past July! I returned three weeks ago from a whirlwind trip to my adopted homeland, Australia, where I enjoyed the great privilege of being a Visiting Scholar at the University of Melbourne’s Trinity College. I led a master class broadcast via videoconferencing across South Australia and to the world via the Web. 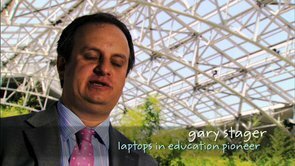 I was also the keynote speaker for a terrific conference in Brisbane, Queensland not far from the first school 1:1 “laptop” school where I led professional development nineteen years ago (Coombabah State Primary School). I then flew home, taught two grueling sunrise-to-sunset weekend doctoral courses, attended to various domestic adventures. Just as my might New York Jets began disappointing me, I boarded a flight to New Zealand in order to be the opening keynote speaker at uLearn09 in Christchurch, a city I’m visiting for the first time. My keynote is “10 Things to Do with a Laptop: Learning and Powerful Ideas” and I’m also leading two workshops of “The Best Educational Ideas in the World: Your Ticket to Constructing Modern Knowledge.” Immediately after my second workshop I fly via Sydney to Melbourne, Australia to lead a day of professional development at Methodist Ladies’ College (MLC) before returning to Wellington, New Zealand three days later to lead another day of PD before jetting back to the USA (via Auckland) that evening. Working at Methodist Ladies’ College, albeit briefly, is quite a thrill since it is famous for being the first school in the world to have a personal laptop computer per student. In fact, my colleague Steve Costa has been teaching 5th and 6th grader with laptop since George Bush Sr. became President of the Untied States (Yes, 1989!) It is rare that you get to know the “patient zero” of any movement, but my friend Steve Costa was the first teacher in the world to teach with laptops and he has been doing so everyday for 20 years. That fact only adds to his remarkable gifts as an educator. From 1990n through the mid 90’s I spent months and months working at MLC and then the dozens of schools hoping to emulate the school. At that time, MLC was led by the most important school principal of the last half century, David Loader. David saw something in me and trusted this kid from New Jersey to do anything I believed would make his school better. He spared no expense when it came to enhancing the learning environment for his students and teachers and afforded me constant access to the principal, a privilege I rarely enjoy these days. I learned so much from my work at MLC. It will be great fun to return after more than a decade away. Few of the dozens of teachers I mentored are still there. Some have retired and many others went on to lead their own schools, run companies or become academics. So, I can’t wait to meet another generation of MLC teachers. Hopefully, we’ll get to work together more in the future. For those of you interested in the history of 1:1 computing in schools, especially Methodist Ladies’ College, read Bob Johnstone’s book, “Never Mind the Laptops,” and watch this blog for announcements of old documents I’ll be republishing in the near future.